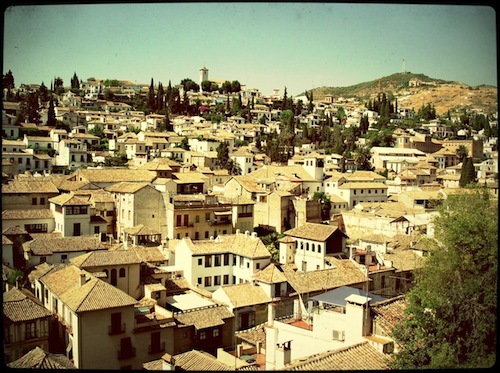 The Spanish Civil War raged the length and breadth of the country between 1936 and 1939, so why Granada? 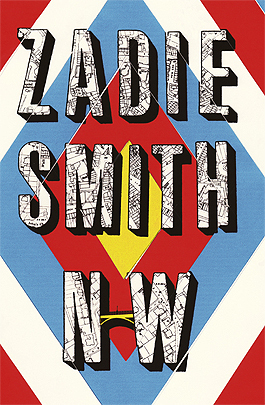 Why did I chose to focus my narrative around this one place? (And, to a lesser degree, Barcelona – a city I’ve never been to, but long to). Well, I’ll tell you a little story. Back in 2002 I was living and working in Seville. My father (who was American but lived in Malaga) had recently died and I decided to spend the two months of my summer holidays travelling around Spain before returning to Seville in September, making sense of this sudden lack of a father in my life and exploring some of Spain’s diverse towns, cities and small pueblos (how I never made it to Barcelona is beyond me). 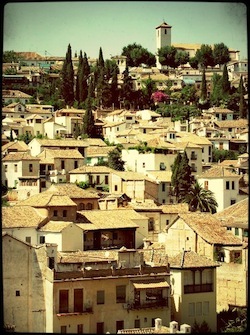 The final place I visited was Granada. I booked me and my rucksack into a cheap pensión, then spent a few days pounding the city streets. I say ‘city’ streets, but this seemed to me a city that spilled effortlessly into the countryside. You see the hill in the top right of this photo? Well, I sat on this hill in Granada’s Sacromonte districts (where Luisa & Eduardo meet in my novel), stared out at the ochre-roofed city below me and realised I’d fallen hook, line and sinker in love with this place. So I went back to Seville, packed up my belongings, quit my job and hot-footed it back to Granada. It didn’t take long before I found myself somewhere to live and another job. I was teaching English as a foreign language and a great thing about this is there is never, ever a shortage of work. Plus my working hours were from 2-9pm which, for a non-morning person like me, was as good as it gets. I lived in a fourth floor apartment on Calle Molinos with a mad old dueña (landlady) with wild, white hair and crooked spectacles who often carried a leg of ham over her shoulder she’d just picked up from the butcher. We called ourselves La Casa del Locos, the house of the crazies, because the five of us were from England, Portugal, Austria, France and Spain and we spoke a distorted, scrambled, multi-lingual kind of Spanish with the only Spaniard among us (who smoked and swore like a trooper) having such a thick Andaluz accent, liberally peppered with slang and obscenities, that is was often unintelligible. 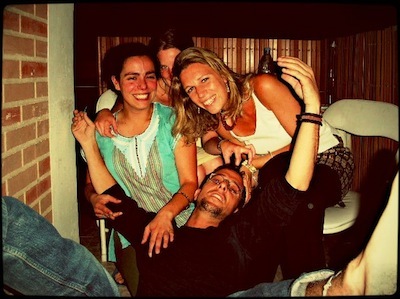 But somehow, we all managed to understand one another and it was a year and a half of delicious fun: listening to live music galore, exploring Granada and its surroundings, eating tapas and trying to dance flamenco in the flat whilst the neighbours below us banged a broom on their ceiling to tell us to pack it in. We would often walk to the other side of the valley to the Albaicín district and it was here that I first discovered the beauty and wonder of what lay beyond those inconspicuous wooden doors. I was blown away by these Carmen’s as they’re known (houses set around courtyards) which served as the inspiration for my house in the novel, Carmen de las Estrellas (Carmen of the stars). 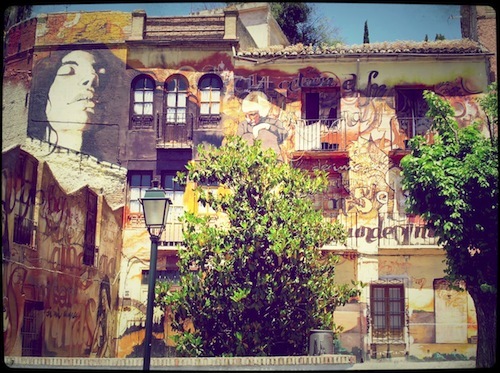 Wherever you look in Granada, there is art, often painted on to the sides of buildings. 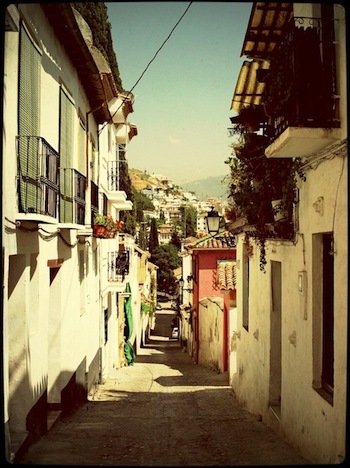 Walking down one of the narrow alleys in the Albaicín. 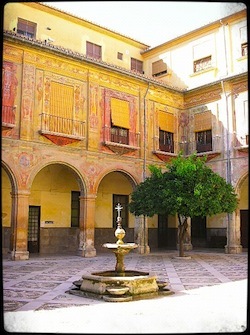 The Albaicín, where the Torres Ramirez family from the novel lived. The church at the top is La Iglesia San Nicolas. There is a square in front of the church with fabulous views where I used to spend a lot of time city gazing and thinking. In The Poet’s Wife, this square is where Aurelia goes with Isabel and Henry towards the end of her life and tells them she won’t be around much longer. You know, I nearly stayed in Granada. But I do believe all things happen for a reason and, after 18 months, it was my time to leave. 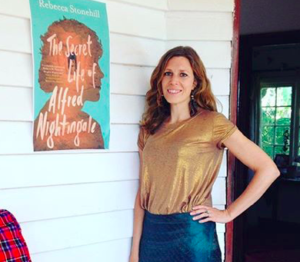 But I vowed I would be back and, more importantly, that one day I would write a novel set there. 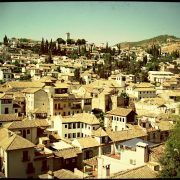 http://rebeccastonehill.com/wp-content/uploads/granada6.jpg 956 1280 Rebecca Stonehill http://rebeccastonehill.com/wp-content/uploads/mtbsdpgw.bmp Rebecca Stonehill2015-01-27 14:41:512015-01-27 14:41:51Why Granada?